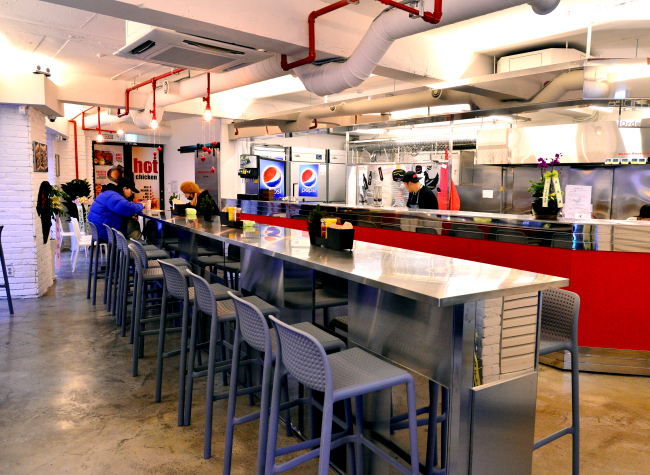 The journey began when five guys decided to take a stab at Korea’s fried chicken market. Choi and his colleagues balked at the idea of jumping into an already crowded and competitive industry without a specific idea of what kind of fried chicken they would be serving. The guys landed on Nashville-style hot chicken, believing the spicy variation on fried chicken would appeal to Koreans, whose food culture is already rooted in fiery staples like kimchi and gochujang. By then, Nashville-style hot chicken had gained traction throughout America, so much so that Kentucky Fried Chicken released its take on the spicy chicken in 2016. When they decided to fly out to the States to see what all the fuss about, there were plenty of options to choose from. Choi and his colleagues started off by visiting two Nashville-style hot chicken spots in Los Angeles before driving out to where it all began. Rumor has it Nashville’s hot chicken was born when the girlfriend of a supposed philanderer served him spicy chicken as payback for his wandering eye, only he loved the chicken so much he and his family started selling it. According to this tale, that family business evolved into the now iconic Prince’s Hot Chicken Shack in Nashville, Tennessee. Naturally, when Choi and his colleagues arrived in Nashville, Prince’s Hot Chicken Shack was one of their stops, but it was only one of a total of 52 spots on their ten-day itinerary. Choi said he ate multiple servings of hot chicken in a day, hopping from one spot to the next. After their trip, Choi and his colleagues were faced with the task of coming up with their take on hot chicken. 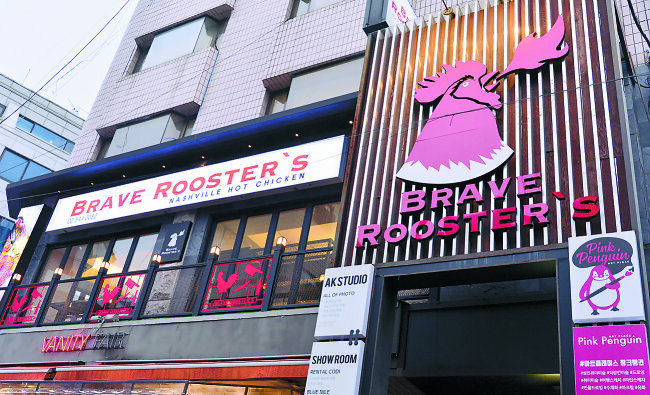 This November they soft opened Brave Roosters in Sinsa-dong, Seoul. “Our grand opening is slated for Dec. 1,” said Choi. 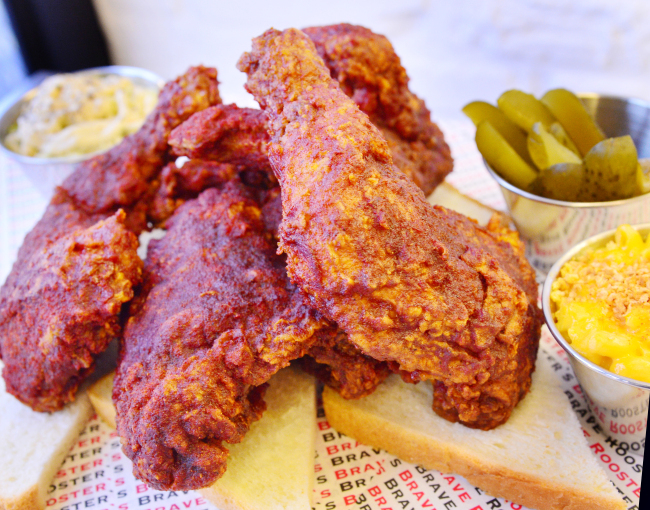 The hot chicken at Brave Roosters, like many spots in Nashville, are sold at varying degrees of heat -- a total of five, to be exact, that range from mild to crazy hot. Choi says things start to get piquant at medium and then significantly more heated at hot. After hot, the remaining two levels are incredibly spicy, and in Choi’s opinion, crazy hot is just that, only to be tried by those whose are deeply devoted to insanely fiery food. At Brave Roosters, a whole bird, at a medium level of heat, is a deep burnished red, and is served as a hefty two thighs with drumsticks attached and two breasts with wings attached. The chicken arrives perched over slices of bread, as is the custom in Nashville, and is incredibly juicy and moist with a thin, uber-crisp shell of fried batter. “We just want the batter to play a helping role,” Choi said they wanted to put the focus on the chicken, which is brined the day before with salt, milk and spices before being batter-fried and seasoned. One bite releases a jumble of flavors, including the tang of vinegar, the heat of chilies and a series of unidentifiable spices -- Choi was only willing to divulge that thyme and nutmeg are used. The majority of the heat, says Choi, comes from Caroline Reaper peppers and ghost peppers, also known as Bhut jolokia peppers. Both of these cultivars are famed for being uber-spicy. Hot chicken is also available as a burger and Choi added that plans are to release a hot chicken waffle sandwich in December. So why the moniker Brave Roosters? For Choi and his colleagues, attempting to go shoulder to shoulder with so many competitors takes courage.